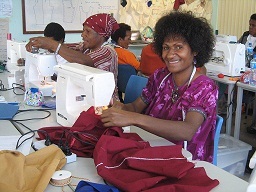 The goals of this online Rotary club (of which Hobbysew’s founder, Tony Castley is President), focus on international projects which support development in poverty-stricken countries. The e-club was set up for the convenience of Rotary members who find it difficult to attend meetings in person. The e-club recently celebrated their charter with a dinner on Friday 24th, and welcomed 2 new members, Lynne Anderson and Maree Coy, both of whom are “mad quilters”. And of course “mad quilters” are always welcome to sign up on the Sewaid website, too. To celebrate three special events have been planned. The first is a new amateur quilting competition, with over $20,000 in prizes for quilters under the age of 35 (from students to adults), themed “How Does Your Garden Grow”, and sponsored by Quilters Companion, Brother and Material Obsession. Hobbysew is pleased to announce that the first 100 entrants in the Guild’s ‘2012 Under 35s Quilt Competition’ will receive a $20 voucher to be spent at any Hobbysew store. Just for entering! So come on all you young Hobbysewists, check out the Guild’s website at www.quiltersguildnsw.com.au for details on how to enter your quilt. All quilts will be exhibited at Newington College Art Gallery, Stanmore NSW 21-23 September 2012. Next is a new category at the Sydney Quilt Show for 2012 “Master Quilter”. This is an invitation only category for quilt makers who have won either major state awards, Best of Show awards or international awards. The Sydney Quilt Show is an exhibition for members (many of whom are Hobbysewists), and is held in conjunction with the Craft & Quilt Fair, 13-17 June 2012 at the Exhibition Centre, Darling Harbour. In addition, the Bernina Best of Show and Best of Australia quilts will be exhibited, as will a special display from an invited Guild member, quilts from regional groups, challenge quilts and over 400 member quilts. Visit www.craftfair.com.au for visitor information. Canberra Day is a public holiday held annually on the second Monday in March in the Australian Capital Territory (ACT) to celebrate the official naming of Canberra. 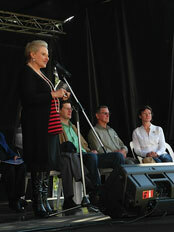 Canberra was named at a ceremony on 12 March 1913 by Lady Denman, the wife of the then Governor-General Lord Denman. 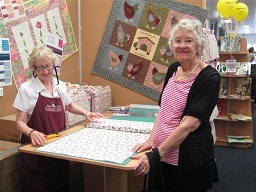 Hobbysew are a proud sponsor of the 2012 St Ives Show’s Patchwork and Quilting Category! Come and join us on Saturday & Sunday May 19 & 20! Below is a short message from Christine, the St Ives Show Co-ordinator. Northern Suburbs A&H Society Inc are delighted to have Hobbysew as the sponsor of our Patchwork and/or Quilting category for the 2012 Annual St Ives Show. I believe quilts have such energy. They are about history, family, community, patience and beauty and can sometimes be life changing for those who stitch them. Some modern quilts depict events and/or disasters which stir emotion. So much so that all who see them, quilters or not; enjoy, discuss and are in awe of them. I am really looking forward to displaying your entries and I know the visitors to the show, especially the younger generation, will have many questions about them. 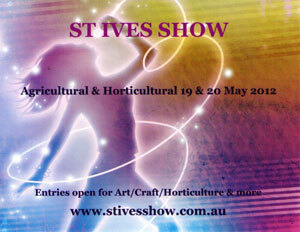 Since early in the 20th Century St Ives Show has had a proud history. In the early years it was held just prior to the Royal Easter Show. (see our website for History of Show) Now, however, it is one of the first to be held in the show cycle with the Royal being held in April and St Ives Show in May. Judging the categories will be Judges from the NSW Guilds and Associations together with teachers of the craft and members of District A51 Inner Wheel Clubs (Sydney to Wollongong), who as a Community Service are assisting the St Ives Show this year. Hobbysew have also been kind enough to provide a Judge from their skilled teachers for which we are very grateful. So get those entries in as soon as you can and I will see you at the show. Craft and Sewing Show at www.craftandsew.com.au; Craft & Quilt Fair at www.craftfair.com.au; Australasian Quilt Convention at www.aqc.com.au. Of course your creations need to be beautifully quilted too, so why not consider taking advantage of Hobbysew’s quilting service. We have many patterns and designs to choose from at our Kings Park, Figtree and Echuca stores www.hobbysewechuca.com.au which use Gammill Statler Stitcher longarm quilting machines to quilt your tops for you. Click on the link on our home page for complete details. 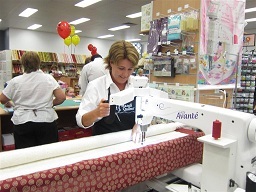 Also at our Top Ryde store (and soon at Erina, too) we offer an in-store DIY service on Handi Quilter “Avante 18” machines for an hourly rate of $25. Easy & fun to use, once you know how. Top Ryde store runs a 2 hour, one-on-one training lesson on how to load your quilt, free motion, how to use pentographs and groovy boards. No more having to pin your quilt top before you quilt – yeah! Bookings are essential, so phone them to set a date for your lesson. After you complete your lesson, you are presented with a certificate and you also get a Hobbysew discount of 25% off battings and backings. Then just book the Handi Quilter whenever you have a new quilt top to finish. 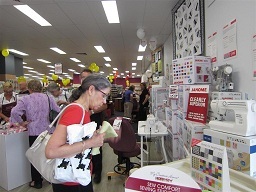 What a fantastic day at Hobbysew Erina on Saturday. A large crowd had gathered outside the doors before they were even opened and then the rush began! 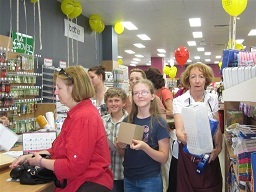 Take a look at the photos to see the fun and excitement which rippled through the store all day. So much to see and do. The store looked stunning with the weather turning out to be amazingly sunny. Everyone enjoyed receiving the complimentary handouts during the day and stock just flew off the shelves. The best sewing machines in the shop, such as the top of the range Brother, Janome 12000 and Husqvarna Diamond’s were just snapped up. 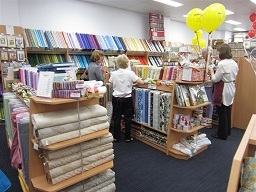 And the fabric – metres and metres of fabric browsed by quilters who were thirsty to see and buy the best range all together in one shop. 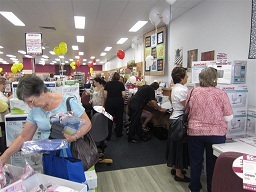 All along the Central Coast you can hear the click of scissors and the whir of sewing machines as quilters get down to starting their latest projects using all the new goodies they purchased at Hobbysew Erina. If you haven’t seen it yet, come along in and join the fun, or better yet sign up for a class. Karen, our store manager is scheduling the class programme to start in a couple of weeks and even non-sewers came to our store keen to enrol in classes for the first time. There were also quite a few enquiries about the kids classes, which is exciting and what we are all about….bringing new crafters on board. Management would like to extend their thanks to the sewing machine companies Janome, Husqvarna and Brother for their support in having their demonstrators working in store throughout our opening day. Thanks also to all the fabric houses for the stunning fabric ranges enjoyed by so many of our customers. Thanks to Star FM 104.5 radio who featured our opening with a live broadcast from the Centre promoting Hobbysew on the Central Coast and thanks to Erina Fair Centre Management for making us feel so welcome.